To make my homecoming easier after the birth of my daughter, my sister stocked my refrigerator with small containers of beautifully prepared fresh fruits. She assumed, correctly, that fresh fruit would make a perfect grab and go snack for a new, tired, nursing mom. Today, as I prepared fresh fruit for my family, I was reminded of that wonderful gesture of love. 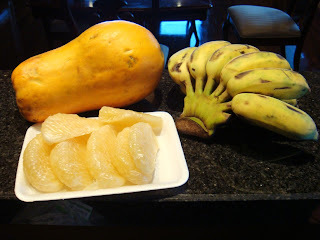 So, thoughts of my sister, prompted me to share a few of Thailand's many exotic fruits that we're enjoying on a regular basis. The wildly brilliantly colored dragon fruit, native to South America, is grown with great commercial success in Thailand. And, they are at their plumpest and freshest, of course, before they are shipped around the world. So much so, in fact, that the few dragon fruit I've seen in the US don't even look like the same fruit. As you can see from the picture, it is a small football-like thing with "scales." Bright magenta with lime green tipping, the fruit's exotic skin is only the beginning. 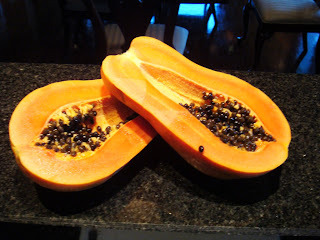 Peel back the skin like a tangerine and you're greeted with, depending on the variety, either a bright white flesh studded with tiny black edible seeds or a flesh the same color as the magenta skin. (Note: Unless you want people to question what you've been up to, don't cut a purple-fleshed dragon fruit and schedule a manicure, like I did, for the same day!) The taste of a fresh dragon fruit is earthy-- like a great aged red wine is earthy. And, the seeds pop like tiny little pieces of caviar as the white (or purple!) flesh gives way. 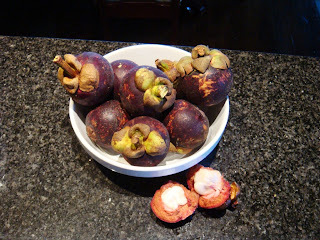 Another fruit that you may not have seen yet in the States is the mangosteen. Little purple globes, about the size of a golf ball, hold just a few white fruit segments inside. They take some work to pull apart, but inside you are rewarded with a taste that is unparalleled. Think about the cross between a mango, a sweet grape, a tiny burst of lime and, if you can imagine what warm sunshine might taste like, add a dash of that too. They make a nice one bite treat when you're up for a little bit of work in the shelling/peeling process. So, here I am, in my Thai kitchen, missing and thinking of my sister. Four years after she prepared containers of fresh fruit to fill my refrigerator, my daughter is opening the fridge's door and removing a freshly prepared container for her snack this afternoon. A spin on the classic, use whatever fruits you enjoy and have access to. On a large plate, place your fruit in a flat layer, slightly overlapping the slices. Squeeze the juice of one lime over the fruit. Sprinkle with mint and basil and a grind of black pepper. Enjoy!